The reasons for anyone to want to trade a breakout of a major resistance or support zone are obvious, but for any trade of such to be taken right at the level is downright harsh. I am sure that more people regret trying to buy or sell into these levels as opposed to actually fading them. Over the past week it has been a non-stop tale of trading momentum across more than a few currencies; the market has shifted into an ultra-aggressive mode and anyone that sits and watches ticks all day can clearly see that it has been a game of bid, bid, bid. For every seller there has been double the amount of buyers. 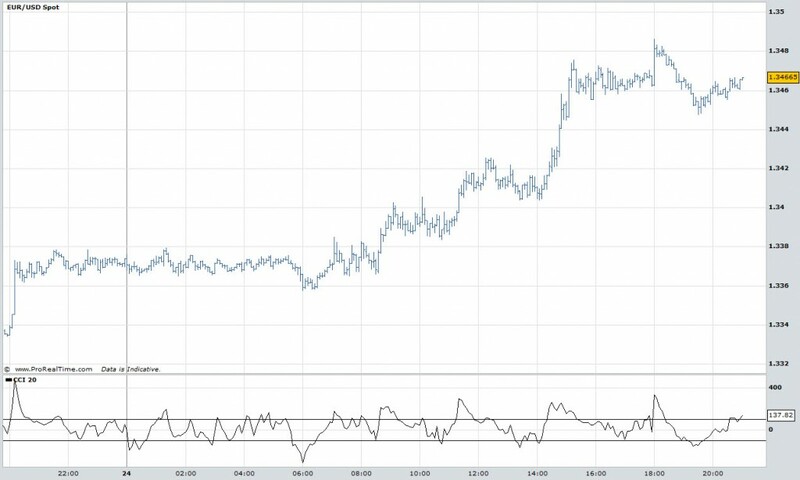 I've seen that few forex traders are ready for this kind of momentum though. There are more than a few techniques I use to see when price is about to make a short-term bottom from a price perspective, but they have not earned much of a discussion here. Today we'll just look at the most basic form of momentum trading, and using nothing but price in the immediate area to determine follow-through. In later articles we can discuss more advanced techniques, but for now, I'll keep it on the simple side. Why do people ignore breakouts on smaller levels? Because they're not a big deal. And that's exactly the reason you should be buying and selling into them as opposed to the major ones. Any major support or resistance level is likely to meet just that: support or resistance. When you enter at such a poor location you are considerably limiting your upside potential and increasing your risk of a move against your position. Again: Countertrend risk increases at these major areas. I do understand the complex though. You get burnt trying to nail something “to the pip” or whatever, so you shift gears and say “I'm just going to play direction”. But playing direction requires just as much strategy as something which does not. The smaller levels go under the radar, get hidden in a mess of sloppy trading by those who are not sitting in front of their desk, concentrated and working arduously all day long. It is either this, or they trade simply from a more macro perspective – longer-term positions, triggered by execution tucked in other spots that have not yet seen price trade through. I post charts here showing more than a few of these from time to time. I'm talking about small diagonal trendlines or other swing indications that dealing desks or professional intraday traders are looking at but many people skip right on by. These are the most basic forms of trading; I am not expecting to “woo” the crowd today, but rather simply prove a point. For the ultimate sake of simplicity, think of it in relation to time. If it is part of the macro trend and took days to develop, you're looking at a major level. If it's intraday, you're talking minor. Simple. Whether horizontal or diagonal, this principle is the same. Longer-term traders are noting a massive diagonal trend line just as much as they are anything horizontal. Everything I'm discussing in terms of smaller levels can be seen on a 5 or 1 minute chart. These positions, like anything else, are going to require some intraday patience. So take it up the 5 min if you're the paranoid type. Below is a recent chart of EUR/USD. I just wanted to show the difference here between a breakout on horizontal support or resistance versus the “small stuff”. 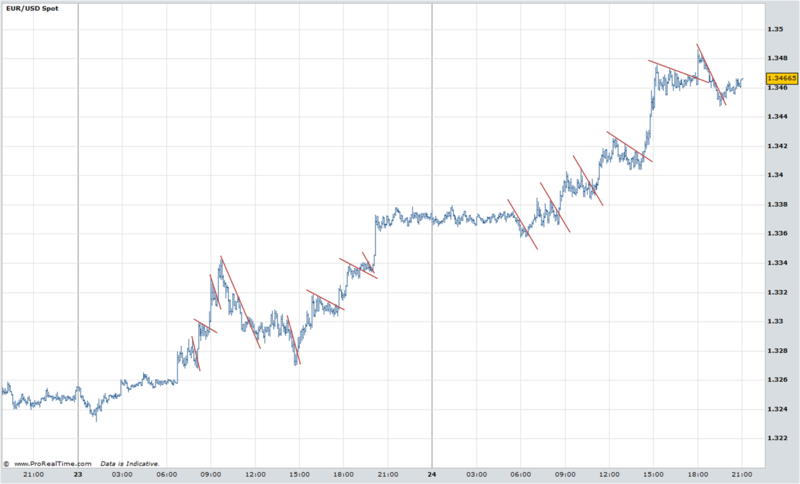 As always, where there are no major support or resistance levels in the area, there is diagonal support or resistance. It will always be there. On this chart, note that I'm marking up clear, obvious trendlines, and also the more relevant in terms of good execution timing (eg the steepest trendline available). Refer back to my article about diagonal trendlines and skip down to the section about fanning. The general rule of thumb: the steeper it is, the more likely it is to break. One of the reasons most people miss major moves is because they can't get past the first few minutes of the trade. I still listen to music every day while I'm trading to basically help “take the worry away”. Anyone that has met me knows that I've got a lot of nerves, and that doesn't translate well into nitty gritty execution. So let's break this down into simple pieces here. I'm zooming in on one of the lines in the chart above, and we're drilling down into a 1 minute timeframe. I'm showing 2 examples here, the first of which I had a had in yesterday and “got me in” for the rest of the session. 1. 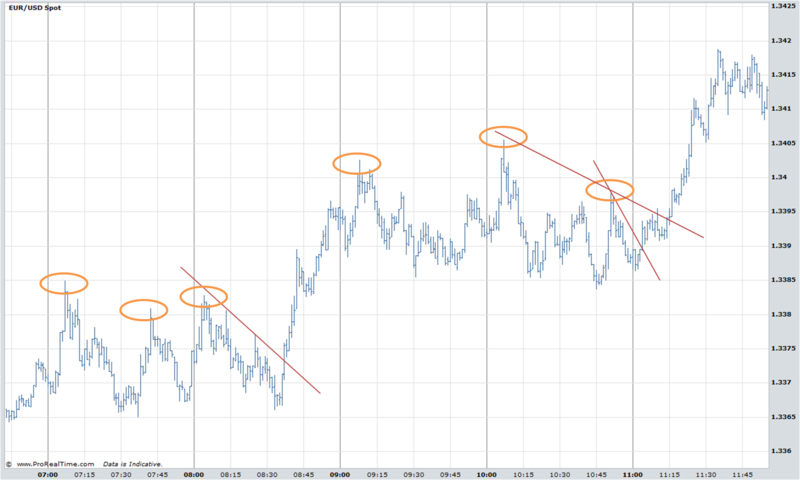 A range is created with several major highs more clearly visible from a 5 min timeframe. I'll usually wait until this occurs in order get better timing on the parabolic move itself. 2 or 3 is typically the number to beat. There are of course times where all you get is some minor slowdown before it takes off again, but they simply aren't as common. 2. Off the final significant high, price gets directional and shows what it's made of. Any order flows countering this move are stepping aside and persistent bidding takes over. I can guarantee you that these will all look different. Price is going to look “scraggly” when you're poking at it on such a small timeframe. It is a matter of getting used to abnormalities. If you're having confidence issues, think in terms of indicators. Pretty much any properly implemented exponential indicator on a short-term timeframe will give you a “signal” to go long or short should your other conditions be met. You are not relying fully on the indicator. You are relying on underlying price action. The indicator is just there to give you courage to enter the trade and get on in. And forget about everything else that has to do with the indicator. Don't let it be a factor in making illogical decisions. It is there for courage of entry alone. I have stated it around here from time to time but probably not enough: I have nothing against the use of any indicator; if it works for you then that is ultimately all that matters. I know plenty of people that essentially trade “price action” as a strategy itself but still utilize an indicator (usually no more than 1) as their means of filling the passenger seat. Below is chart with a simple CCI attached. When you've made highs 2 or 3 times and subsequently end up crossing zero, you're in for the ride. Again, it's an issue with courage and brains, not a crutch, I am trying to address here with with this. The most logical explanation is typically the right one. This could be helpful in just basically “pushing you” to move forward should doubts be clouding your judgement. And PS – I don't use this so I can't provide you with any specifics about it. I literally just grabbed it and threw it on the chart to prove a point. Indicators like this simply track price, then deviate (and present patterns themselves). Again, I'm just telling you this in hopes that it might boost your confidence a bit if you're having issues in the final stage of execution when viewing price action in this manner. The patterns you see here vary, and they're going to be massive in terms of numbers. While I like to keep things simple here, no point in any chart looks the same. If I were to post an image of everythign I come across not only would it be overload but just a a complete deviation from the ultimate point here. Macro themes present themselves. Watching constant bidding like that which we saw on Friday is truly is your best indication of where price is headed next. There are many patterns that price exhibits on a regular basis. Get used to them and know your market. Make sure you are religiously “zooming out” to see the bigger picture. The next article I'm working on is heavy-centric on order flows. I know some of you have been sitting and waiting for it but just so you know, it's underway. Thanks Steve – informative as always. Looking forward to the order flow article. Nice article, Thx. “Religiously” looking at higher TF has been/is the downfall of most scalpers. Something I heard from the beginning but it was only after a couple years of pain I decided to listen. Excellent article because I think you have covered fading PA using horizontal levels very well on the site and I’m happy to see more momentum/breakout trading articles. I’m very much looking forward to your next one. cause when you think about it, this is really what it’s all about. Detecting levels or areas where you have those taps relatively close together. And around three of them really represents a decent amount of interest in that area which, when breached, has a high potential for a followtrough in the form of breakout stop order traders AS WELL AS stops loss order activations. I was actually going to mention that again – the number 3 there, but in this case the pulls tend to get more difficult to identify. Also, you have things like today, where a steady downtrend develops in relatively low vol where you’re getting hit, hit hit all day long (but we’re talking more macro timescale….move today was definitively down all day). But the number 3 is hard to ignore, especially on this pair we see it a lot. Brilliant article, Steve – thank you so much. I originally started trading very short timeframe charts, eg 1 min and 5 min, but fell for all the propaganda that only longer-term timeframe charts “tell the real story”. In this article, you shown how this can work against you in terms of trying to trade the major S+R levels that you and every other trader in the world can see … Having done a little experimentation with the 1 min and 5 min charts using simple PA principles and diagonal trendlines, on the EUR/USD pair, it certainly seems to work well. I like also how one can set reasonably short stop levels on many of these trades, giving a good Reward : Risk ratio – nice one! A breakout in one TF can be a fade in another (running into a perceived resistance or support on higher charts) which makes it difficult to trade especially as a scalper who uses higher TFs. So the conventional wisdom of using multiple TF doesn’t really help when scalping because higher TFs as convincing as they look are hindsight (after the candle or bar is complete while it may look completely different when forming) while intraday moves rarely last long except on trend days. For stocks, it’s best to watch the tape at key levels to get a feel if momentum is there or not and then either fade or go with breakout assuming calculated risk. Also doubling up (i.e switching from long to short or vice versa) helps if your scalp position isn’t working and market is going to go the other way. Hey Steve – Just come across your site and the information is facinating. I’m a beginner and have tried to find an article on your site about drawing inner trendlines. Very basic stuff. I can’t find an article which does this. Can you point me to one? I’m trying to learn this skill but especially distinguish inner trendlines from outer trendlines which seems much more obvious to draw. I should probably assemble one of these. Ultimately, they are discussed here and there but nothing structured/concrete in terms of material I have personally written. Here is a page with a lengthy list of posts where you may find more, although I assume you might have seen this page already: https://paracurve.com/forex-trading-strategies-and-more-the-best-of-nobrainertrades-com Ultimately, it is all about confluence, as with anything else. Always seek the highest number of hits. Inner trendlines provide me with much better performance for a number of different reasons.